Line the bottom of your pot with sauerkraut. – as much as you like. Take the head of cabbage and cut the end off – throw that in your pot or eat it. No rules here! Take the outermost leaves and put them on the sauerkraut. Start filling the leaves until you run out – of leaves or filling! Roll, place on sauerkraut; repeat until you have two or three rows (or more) and cover with a couple of sour cabbage leaves. Fill the pot with water (and add a dash of organice smoked flavoring if you really need that touch). Cook on medium until boils; then lower temperature and cook until you cannot take it anymore! Take a bowl and throw in the vegie ground round, chopped onion, cup of uncooked rice, and all your spices. Spice to your own preference. 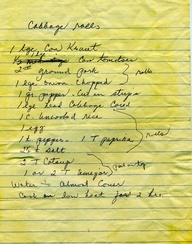 I like my food spicy but keep this recipe close to mom’s original! Mix well. Thats it folks ! The myth of cabbage rolls is dispensed. 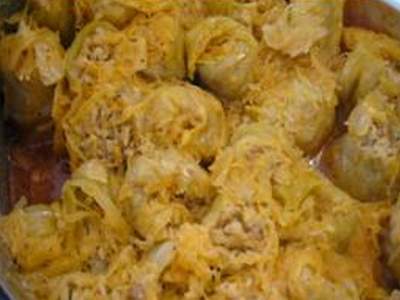 You do not need a large kitchen or ten ethnic women trained in the arts of cabbage rolls to make these. Simple and wonderful. Enjoy.